Dorcy Cap Light Headlight, 3 LED, 13.5 lumens, 13 hr Average Life, White, 2-11/16 in Length, 1.04 in Height, 1.89 in Width, Includes: CR2016 3 V 0.75 mAh Battery, On/Off Bottom Mounted Slide Switch, For Hunting, Fishing, Camping, Mounting And Outdoor Activities LED Headlight, 42 lumens, 12 hour run time, 20 foot beam distance, 8 LED white, 1 LED red ,1 LED green. Push button top switch. Panel swivels 50 degrees. 2 brightness modes, 8 LED high, 4 LED low. Uses 3 AAA batteries, Included. 2-3/4" L x 1-3/4" W. Red, blue colors. 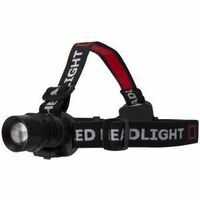 Coast Head Lamp, Adjustable, Series: HL5, LED Bulb, 5 Bulbs, Broad, Even Beam, 183 ft Beam Distance, 175 lumens, AAA Battery, 3 Batteries, ANSI/FL1 Specified, 3 hr 15 Min Run Time LED spot beam headlight, 134 lumen, 12 hours of run time and 3 brightness modes, full power, half power and strobe mode. 118 meters beam distance. Push button top switch. Uses 3 AAA batteries, included. Plastic. 2.75" Width x 1.5" Depth x 1.5 Height, .25lb.